Our house is conveniently located less than half a mile outside Crieff and is situated in a quiet location that provides excellent views of the countryside and also the town of Crieff. You will find the house extremely spacious both inside and out with car parking for several cars and also a double garage that may be used. There is an open fire and we provide all the wood that you will need - even during the coldest weather. Morag and I are both keen golfers and enjoy being members of Crieff Golf Club. We have enjoyed playing many of the golf courses that are in this part of the world. Both of us were born in Crieff and spent most of our working careers in and around Crieff. We have spent many enjoyable holidays renting apartments or villas in the UK, Europe and Florida and think that we have brought these experiences back to our holiday home and provide you with the level of comfort that will make your stay here an absolute pleasure. This location is one of the most desirable locations in the Crieff area, situated in a peaceful spot and less than a mile from the attractive tourist town of Crieff. It is the perfect place to relax and enjoy the countryside. We enjoy the open spaces, the peace and quiet and being able to take our Golden Retrievers, Barney & Buddy long walks round this wonderful part of Perthshire. En-suite bathroom has bath plus shower over bath, toilet, bidet and wash-hand basin. Further large shower room with toilet and wash-hand sink. Also toilet and wash-hand basin in front hall. Wood boiler provides heating and hot water piped underground from main house. Adequate space for several cars. Large living room with sun room attached. Living room contains large modern television with free view. There are three two seater sofas ensuring that your time here will comfortable and relaxing. This is a well equipped kitchen that contains a casual table for breakfast and a further large dining table with six chairs for formal dining. Large fridge freezer, cooker with hob and microwave. Plenty crockery and cutlery for up to twelve guests. Dining table for six plus further table for four in kitchen area. Tennis court and raquets available for guests. Trainers to be worn. Crieff Golf Club has the excellent 18 hole Ferntower course, always in top class condition with most enjoyable scenery. For those who don't fancy the big course there is also an option to play the wee course, the Dornock, a shorter but tricky 9 hole course. Strathearn Hydro also has an 18 hole facility with driving range. You can also play the scenic 9 hole courses in Muthill, Comrie and St Fillans and of course the 3 championship courses at Gleneagles, hosts of this year's Ryder Cup, only 7 miles away. Although not adapted at this time for helping people with mobility problems, this property has been used in the past for wheelchair use, with reasonable accessibility from the outside using the front door. Inside, the hallways are wide enough for wheelchair use and there are no inside steps. Notes on accommodation: Both bedrooms contain copious wardrobe space. The mattresses on both twin beds are medium firm and one half of the super king-size is medium with the other half medium soft. Outside: There is a decking area plus several areas that have been paved around the house. There are two small working greenhouses that can provide you with tomatoes, cucumbers and strawberries in season. An all weather tennis court is available at the owners house which is situated nearby. The properties extend to over forty acres including mature woodland and large areas of broom that provides cover for a variety of wildlife, including pheasants and deer. Most days you can watch buzzards circling and oyster catchers, ducks, geese and occasionally swans on the pond from the comfort of the main bedroom or the sun room. Utility Room: Handy utility room at back door with washing machine, tumble drier, also iron and ironing board with plenty space to change out of walking boots etc. Cleaning / Towels / Linen / Maid service: All beds and bathrooms will be prepared with freshly laundered linen with an adequate supply available for your convenience. The property is cleaned for the start of your stay. Other: The sun room leads off from the living room with seating for six plus further seating available from the two small double sofa beds. Large windows offer an extremely pleasant view over the large pond, the trees and over to Crieff. 5 stars is not enough for this home and it's hosts. Sparkling clean holiday home with everything. The property is a bungalow which suited my elderly mother. Bedrooms were a great size lots of storage. The grounds were beautiful with lots of wildlife and beautiful maintained gardens lots of outside space to sit and admire the views. The owners couldn't have been more helpful and what amazing hosts, can't wait to return and would highly recommend a stay here. Thank you for your wonderful review. It was a great time for Morag and I too, having such nice neighbours next door for the week. So glad you enjoyed yourselves and will be rooting for Hearts in the final Kenny. Hope to see you again sometime in the future. This is a fantastic bungalow in a beautiful tranquil setting. The large picture windows overlook a huge garden and pond where you can watch loads of wildlife. We were overwhelmed with the welcome gifts and the thought that goes into what guests might need. Although the property is situated away from the hussle and bussle of towns, they are all easily accessible giving the best of both worlds. George and Morag are the perfect hosts who certainly go above and beyond, and our sincere thanks go to them both for providing us an amazing holiday and somewhere I am sure we will return to. It was a pleasure to welcome Euan and his family. They were perfect guests. Morag says well done on completing the puzzles! We look forward to seeing them again in the future. great in every way-thank you again. Thank you very much for your kind words. Morag and I are delighted that you enjoyed your return visit to Little Braidhaugh and we hope to welcome you again in the future. Thanks for making our week easy and enjoyable. Thank you for your kind comments. We are glad you enjoyed your time at our property and its always a pleasure when our guests are as nice as you. Look forward to seeing you again in the future. Apart from all the amenities provided and cleanliness .... the welcoming feeling felt by the bungalow itself is truly un explainable ... not to mention the owners...who are so friendly and very very helpful... truly if you re going to Scotland this property is a must view for sure again not only is the place very nice to stay in but the location also is quite centralized aswell (a big bonus for me and my family as we travelled quite a number of destinations while we were there ) once again a must see and 2 big thumbs up ! Both Edinburgh and Glasgow Airport are less than 60 miles away and usually take around an hour to get to them. 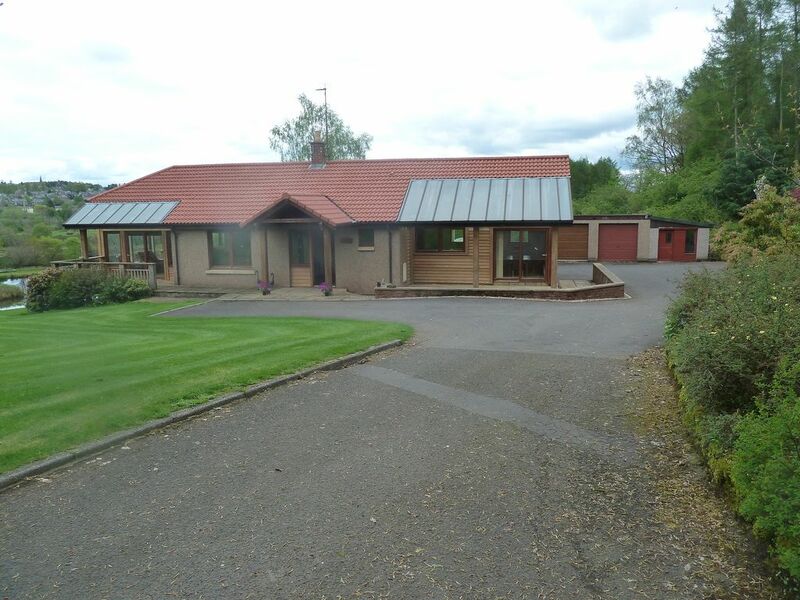 The property is just over a mile from the centre of Crieff and approximately 18 miles west of the Fair City of Perth. Edinburgh and Glasgow are around 1 hour away by car. You will find a good array of independent shops in Crieff, including Gills, an old fashioned grocer with a wide selection of whiskies. Harrisons has an superb range of wines to suit all tastes and pockets. Campbells bakery provide tantalizing cakes, breads and pastries. We have the Gordon & Durward sweet shop known throughout UK for their sugar mice and tablet. A excellent butcher and fishmonger should you wish to eat in. The town is well served with good eating establishments with Yann's - our favourite, The Lounge, Pura Maison, Delevino and the Tower Gastro also good choices. The Deils Cauldron in Comrie is also well worth visiting and you will not be disappionted. Things to do in Crieff include the Leisure Centre for swimming and gym facilities. Macrosty Park & Lady Mary's walk is lovely. Horse riding at the Hydro Riding Centre at the top of the town. The Crieff Visitor Centre is always popular, so too is The Famous Grouse Distillery (the oldest in Scotland) that sits only a mile from Crieff. Also within a mile from Crieff are Drummond Castle Gardens and just further afield sits Innerpeffray Library and Chapel. In Perth you have the Black Watch Museum, well worth visiting and also Scone Palace. Whilst in Perth a good place for lunch is at McDiarmid Park home of St Johnstone, and if you are any good at football, they might sign you up. Stirling is only half a hour away and you can visit the castle, the Wallace Monument and the Battle of Bannockburn experience. If you like fishing there is a complimentary fishing permit for one person to fish the Crieff Angling Club waters on the River Earn at Upper Strowan, Braidhaugh, Drummond Castle and Loch Turret. Further permits may be purchased from Boyd's Newsagents or the Tourist Information Centre Crieff and there are numerous other fisheries within 30 minutes drive. Booking Notes: We require £100 non returnable deposit in order to confirm your booking with the balance due 4 weeks before your arrival. Changeover Day: Preferred change-over day is Saturday with arrivals from 4.00pm and departures before 10.00am.